In the first reading, the elderly Abram (who will become Abraham) is called by God to leave his country and everything he knows for an unknown and far off land. Abram begins his journey of faith trusting that God will keep his promises of blessings to Abram. Although Abram must have wondered how God was going to make him a great nation, that his name would become great, and that all people would receive blessings from him, Abram never questioned the Lord. He just went. Like Abram we are on a forty day spiritual journey. We are not really sure where God is leading us or where we will end up. But we struggle to hear God’s voice as we strive to answer God’s call to live holy lives. We do know, in the words of the psalm, that “Upright is the word of the LORD.” Confident that God is merciful and trustworthy we proceed on our Lenten journey. But we know that the journey will not be easy. Proclaiming the Gospel and striving for holiness involves suffering and struggle. It is only through the grace of Jesus Christ that we can have the strength to endure. We can endure because we know that if we persevere we will become like Christ in all of his glory. In the Gospel Peter, James, and John get a glimpse of Christ as he will appear after his resurrection. They are allowed to get a preview of Jesus in all of his glory to help them bear up during the difficult times that lay ahead of them. Jesus is revealed as the Son of God when the Father’s voice proclaims, “This beloved Son, with whom I am well pleased; listen to him.” On hearing this the apostles were overcome with fear, and they fell face down. But when Jesus reassured them, they looked up and saw, “no one else but Jesus alone”. Jesus is the only true mediator between God and man as we journey towards our final destination. As we walk with Jesus through our Lenten Journey of suffering and death to sin to final glory, we struggle to listen to him and do what he says. 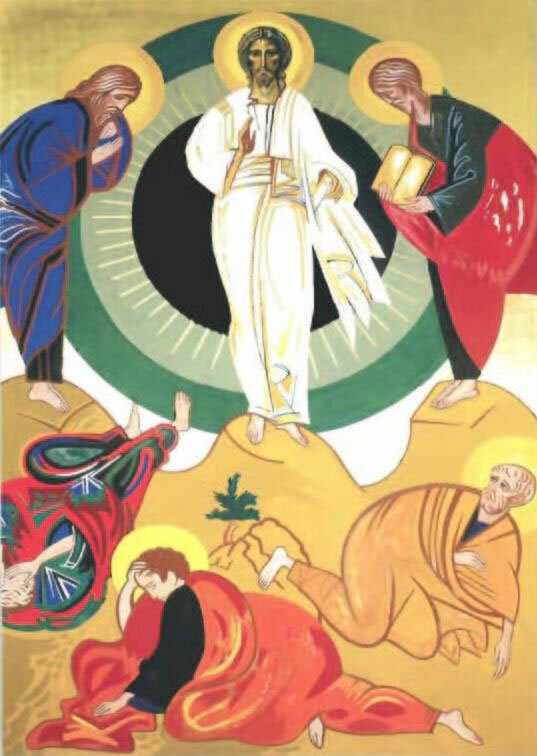 This entry was posted in Liturgical Year and tagged Lent, Sunday Reflection, Transfiguration. Bookmark the permalink.